Day one of the biggest event of the year has just wrapped and what a day it was! From the second the doors of General Session opened at 8:30am, the energy from the crowd was infectious and with so many exciting announcements to come, it’s no surprise why! The crowd went wild for the launch of three new products – Harvest Thins™ Thai Sweet Chilli, e+ Lemon Lime and IsaLean™ Shake Chocolate Mint. One lucky winner was drawn for a ‘minute to win it’ opportunity, where they were let loose in the Store in the World of Isagenix for a full minute to grab as much product as they could for FREE. With so many amazing products to choose from, our new Product in the Spotlight, e+, was definitely a favourite along with IsaDelight™ chocolates and our AMPED™ range! Our incredible Round 3 IsaBody Challenge® Finalists for 2017 were announced along with our IsaBody Challenge Grand Prize Winner for 2018, Claudia Tomczyk, who took home the $10,000 grand prize along with her brand-new title. Ending day one on a high, our final Keynote Speaker, the one and only Peta Kelly, empowered the crowd by encouraging them to be present, positive and create their own future. Missed out on the action? 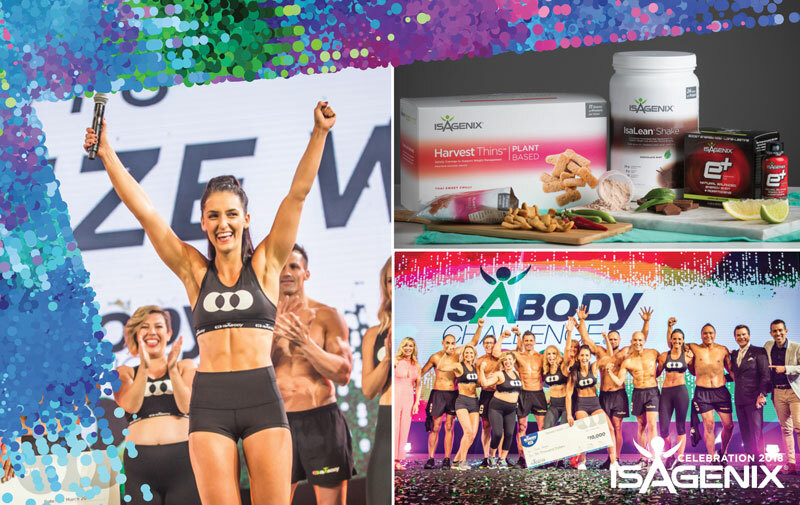 Check out the highlights from day one below and be sure to subscribe to ANZ.IsaFYI.com and join the Isagenix ANZ Facebook page to stay in the loop. *Isagenix Legacy Club Millionaires are defined as Isagenix Associates who have cumulatively earned $1 million or more with Isagenix. Earning levels for Isagenix Independent Associates that appear in this publication are examples and should not be construed as typical or average. Income level achievements are dependent upon the individual Associate’s business skills, personal ambition, time, commitment, activity, and demographic factors. For average earnings, see the Isagenix Independent Associate Earnings Statement found at IsagenixEarnings.com.